Perhaps the real fantasy was that I would be able to finish this piece? I do love blackwork, but some of these motifs are pretty random and don't follow the same rhythm of stitching I'm used to from other blackwork pieces. A new plan to help with the seemingly random designs is to do them in all 4 quadrants so at least I'll be repeating the same random pattern a few times to hopefully speed the process along. 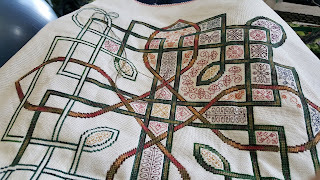 Still, not my favorite piece to work on, I'm to the point of pulling something new out to work on as I've gotten several motifs stitched and as well as filling in the green band but I'm still not feeling any more love for working on this piece. Next up will likely be a new start. While sorting through the stash, I realized I only have 2 more dodecagons from the Jim Wurth series I purchased several years ago. Once those 2 are done, they can all be framed and go on the wall and out of my finishing drawer. 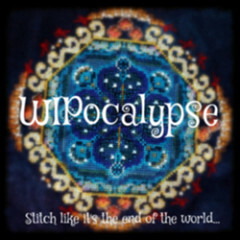 I wouldn't be me if I didn't have more projects started than I could reasonably work on at once so why not start a few more. 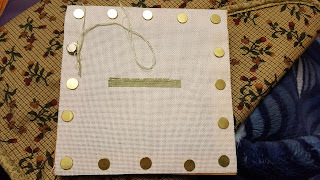 I had a plan when I started this, and I did get 2 near finishes out of it. After completing the Isotta pieces, I figured it was worth a try to dig out a few more, smaller projects to do the same and thin the stash pile. First was Flight of fancy Myrtlewood Pincushion. Looked like a quick stitch, then I got started and realized it's all over 1, so I need good light and possibly magnification to see what I'm doing. Not exactly something to keep in my purse to stitch in the car or if I'm out and have some downtime waiting for an appointment. I've managed to get a few things done over the past few months, the record rain and cold persisted and I still wasn't up to hiking so I didn't leave the house unless necessary. 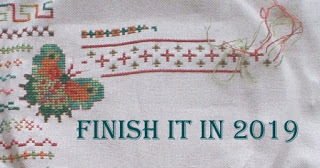 The Linen band sampler is almost done, still. I've got the last section in, cut and I'm at the point of wrapping bars and adding the decorative stitches so it was put away again until I have bigger blocks of time to stitch. Once I start a block I don't like to leave it half finished as the threads can lose tension and I'm likely to forget where I was in the design. 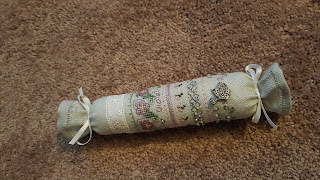 I did manage to finish my pansy needle roll and take this completely awful picture of the finished piece. 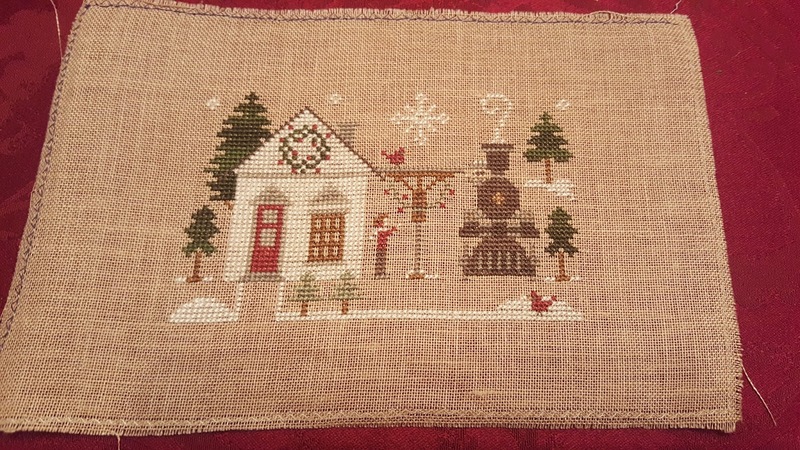 I started this one in 2012 from the note on the chart, then I promptly misplaced it in the house and didn't work on it again until late last year.